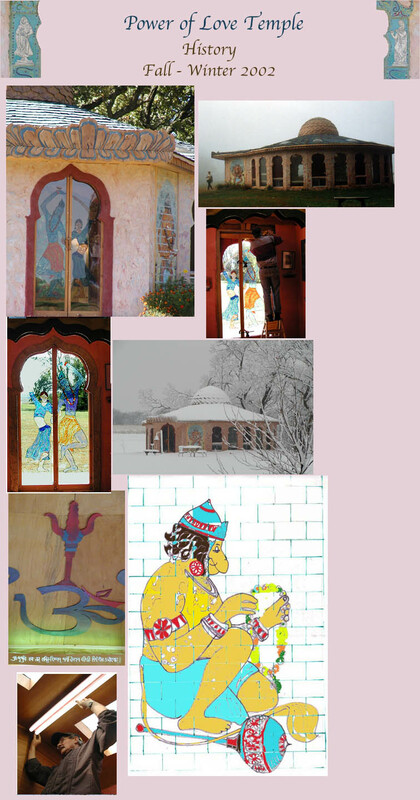 The front doors have acrylic panels with a pseudo-stained glass design of Sri Krishna dancing with a Gopi made by Leela. The door handles are like the f-holes in a violin. Dale is installing the door brackets. Winter brings such beauty and peace and solitude high up here in the Loess Hills. During the winter of 2002-2003 Leela made the 8 foot tall Hanuman sculpture for the exterior of the temple. This is the pattern for the stoneware. Dale is installing lights in the entry.